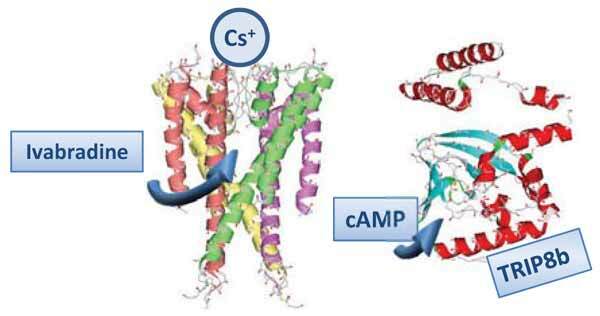 Hyperpolarization-activated, cyclic nucleotide-gated (HCN) channels, the molecular correlate of the hyperpolarization-activated current (If/Ih), are membrane proteins which play an important role in several physiological processes and various pathological conditions. In the Sino Atrial Node (SAN) HCN4 is the target of ivabradine, a bradycardic agent that is, at the moment, the only drug which specifically blocks If. Nevertheless, several other pharmacological agents have been shown to modulate HCN channels, a property that may contribute to their therapeutic activity and/or to their side effects. HCN channels are considered potential targets for developing drugs to treat several important pathologies, but a major issue in this field is the discovery of isoform-selective compounds, owing to the wide distribution of these proteins into the central and peripheral nervous systems, heart and other peripheral tissues. This survey is focused on the compounds that have been shown, or have been designed, to interact with HCN channels and on their binding sites, with the aim to summarize current knowledge and possibly to unveil useful information to design new potent and selective modulators. HCN channels, Hyperpolarization-activated current, Ivabradine, Drug design, Selectivity, Atrial and Ventricular arrhythmia, Atrial fibrillation, Parkinson’s disease. University of Florence, Department of Neurosciences, Psychology, Drug Research and Child’s Health, Section of Pharmaceutical and Nutraceutical Sciences, via Ugo Schiff 6, 50019 Sesto Fiorentino, Italy.